The Hotel Cala Bona enjoys a marvellous central position and has a very friendly atmosphere. Stayed on the recommendation of friends and wasn’t disappointed. Paid a little extra for a sea view room, but was well worth it for the view over the harbour. Being probably the original (and only) Hotel in the resort (before it became a resort) dating back to 1924 it’s obviously kept up with the times and is by no means dated. The harbour front section has accommodation and the main bar. The reception, restaurant, pool and further accommodation are in another block at the rear, with another three separate blocks located along the harbour front. All public areas of the Hotel were always kept immaculately clean (as were the rooms) Food was of excellent quality. One advantage we found was that you are allocated a table in the restaurant for your entire stay, which obviously meant that everyone was catered for at meal times - meaning no queuing that we have encountered before in bigger Hotels where guest numbers outweigh restaurant seats. Most of the Guests were of the ‘mature’ years although there were some younger couples, but very few young families. (May have been the time of year) Another nice touch was that in the evenings (which at the start of the holiday were a little chilly) the Hotel put some blankets out on the outside seating area for those guests who preferred to sit outside the main bar. Overall a very enjoyable Holiday both in the Resort and the Hotel. We had booked a pool view room however on arrival was told that they only have 8 of these rooms and none was available. We were allocated a room over reception which turned out to be fine. Very clean and spacious, immaculate bathroom, large balcony and air con. The only negative things about the room was the view from the balcony. We overlooked another section of the hotel and our view was their balconies and if curtain open their rooms. Needed our curtains shut most of the time for a little privacy. The staff at the hotel were all very friendly and helpful. The food in the restaurant was good. Full English breakfast available each day, with the usual fruit, croissants etc. The meals in the evening usually consisted of a fish dish, meat and salad. Although not always hot enough. Various sweets available and ice creams. Felt the tables in the restaurant were a little too cramped together. Couldn’t get a sunbed round the pool for the whole week we were there. Definitely not enough pool space for the number of guests. This was our first stay at this hotel and we were not dissappointed, Location was a 5+++ and very clean. The waiters were very friendly and nothing was too much trouble for them, the cleaners never stopped all day, there are clean towels every day. The only down side was our room faced into the lane between the two main blocks so not a great view but it became a sun trap in the afternoon, so if you want a veiw ask for a sea view or pool view when you book up. cala bona hotel is in an ideal location. The area outside the hotel is pedestrianised and flat! It is situated on the harbour with lots of boats, fishing and pleasure boats. The food is plentiful with plenty of variety. Often in the evening there were special dishes, eg. paella, Spanish omelette and prawns. The staff are very friendly, efficient and obviously happy working at this hotel. We were there with our grandson who has learning problems and they were so kind to him. Evening entertainment was varied, although there was bingo every night, not for us but very popular. This is our fifth visit to this hotel and we will certainly be back. Stayed in the Hotel Alicia. We been before on several occasions the first time being 2000. Hotel very clean,with good food and is situated right on the beach. The entrance is situated at the back of the hotel and to access the beach you have to walk all the way around. The holiday rep. this year was one of the best we have ever had and came around each day to check everyone was ok. We stayed in the hotel one night to watch the Abba show and thoroughly enjoyed it. You had to be there early to get a seat. Just had an excellent weeks singles holiday at the Hotel Cala Bona which is right besides the harbour. The only slight niggle was, has some one else has already mentioned, if you are on your own at meal times you get put either at the back or at a side table in the dining room. I would not have minded so much but being an early season holiday the hotel was only about half full.You do however keep the same table for the duration of your stay. The hotel is in three blocks fairly close together. The main reception block has the swimming pool and the dining room. The block across a narrow, fairly quiet road has the bar where the entertainment takes place - Country and Western singers and bingo whilst I was there, though I went out most nights. The third block is where I stayed and is known as the Pergola block. Whilst this block is a slight distance from the two main blocks it is the quietest. If you want quiet ask for this block. The bus stop is at the back of the hotel where you can catch buses for most parts of the island, timetables available from reception, as were English newspapers. All the staff I spoke to had good English and were very friendly and went out of their way to be helpful even the cleaners were very friendly. The room had a fridge and electic kettle and cups provided and TV with no charge for the remote. Good choice of channels, Sky, BBC1, BBC2 ITV, channel 5 as well as Spanish and German channels. Shower over a full size bath, balcony with table and two chairs. my room had a side view of the harbour. I would definitely use this hotel again, it is a well run hotel giving good value for money. Stayed at the cala bona for 1 week on our honeymoon. Its in a great position on the harbour, i had emailed them before we arrived to see if we could have a table in the dining room to ourselves because they have a table sharing system, they were happy to do this. On arrival we were shown to our room which was in another block further along the harbour next to the hotel consul, what a lovely surprise we had been allocated a suite at no extra cost, we had a seperate living room, fridge, a/c and kettle. The food was lovely, a very good selection of main courses and desserts. This was the first time we had been to this hotel and will not be the last. The hotel was clean and the food was very good , I am fussy but I always found something nice to eat. We even had a Sunday roast with Beef and Yorkshire pudding that looked and tasted exactly as it should do.You are allocated a table at the start of your holiday in the restaurant and this was great because you didnt have to hunt for a table. All of the staff were very friendly and couldnt do enough for you. The entertainment was reasonable , you had bingo every night followed by a professional show. One of these was a man called John who was very entertaining and very very funny. The hotel has two parts to it. The new part has renovated rooms with air conditioning but if you want a harbour view you need to go into the old part of the hotel, these rooms do not have air conditioning and are quite dated but spotlessly clean. We had one of these rooms and the views were superb.All in all this is a good quality 3 star hotel. travelled with husband and two children ages 13 and 9 on 11th july. 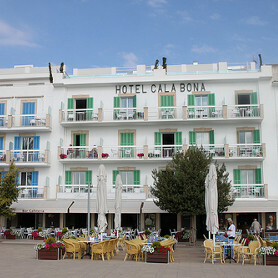 Have been to Cala Bona twice before but never to the Hotel Cala Bona. We had two double rooms which were very nice and comfy beds made every day and room cleaned which was very nice Food was good Air conditioning not great but hired a fan which helped pool ok but can be a bit small when full of children Thompson rep Dan was Great !!!!!!!!!!!!! we went to the pirate show which was the thing the kids loved best. All in all a really good holiday.